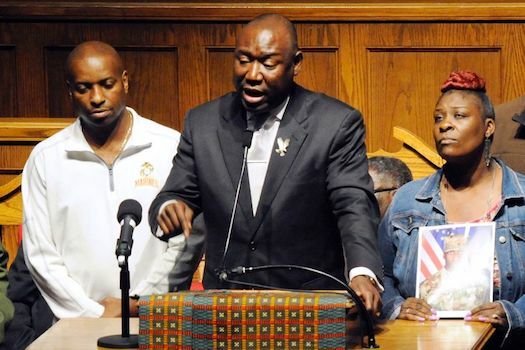 The parents of shooting victim Emantic “EJ” Bradford Jr., Emantic Bradford Sr. and April Pipkins, flank attorney Ben Crump during a com- munity event in Birmingham, Ala., on Nov. 27. Police in suburban Hoover shot and killed their son in a shopping mall on Thanksgiving night, and the parents say they’ve yet to receive official confirmation by the city of what happened. 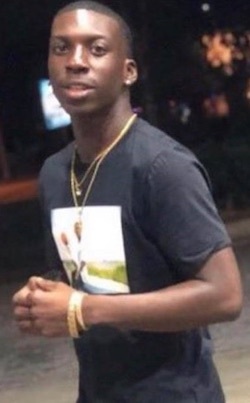 An independent forensic pathologist retained by the family of Emantic “E.J.” Bradford Jr., concluded the cause of death was gunshot wounds to the head, neck, and lower back and ruled the death a homicide, according to an early December report from the victim’s family. The independent probe revealed E.J. was shot three times from behind and not in the face as previously reported. Family attorneys, led by civil rights lawyer Benjamin Crump, explained in detail the manner in which E.J. was killed. A police officer in Hoover, Ala., killed E.J. Thanksgiving Day while responding to gunfire at a crowded shopping mall in the suburb of Birmingham, Ala.
“The doctor opines, based on forensic evidence, that all of these shots were potentially kill shots,” said Attorney Crump during an exclusive interview following a Dec. 3 press conference at Rock City Church in Birmingham. At nearly the same time, the Hoover police department announced it would not release video footage of what happened until after an investigation by the Alabama Law Enforcement Agency. Attorney Crump said the family is trying hard to believe the police department’s promise of transparency in the death of the young Black male. “But it’s very difficult for this father and this family after they were lied to before,” conceded Attorney Crump following the Hoover police department’s decision not to release the video. “Right now, without having the video released, we know based on this autopsy report; it tells us how E.J. Bradford Jr. was killed in cold blood on Thanksgiving night,” Attorney Crump said. 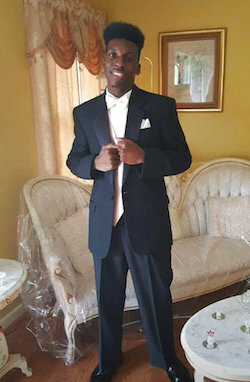 Emantic Bradford, Sr., in an exclusive telephone interview with The Final Call, expressed extreme disappointment Dec. 3 with what was revealed in the forensic report. Over 1,000 people mourned, honored and paid their respects and stood in solidarity with the Bradford family during Dec.1 funeral services. His killing spawned days of intense protests, demonstrations and civil agitation. Police had reluctantly admitted they killed a man who had no part in a shooting that injured a 12-year-old girl and a teenage boy. “Innocent blood has power,” said Rev. Jesse Jackson, who eulogizing E.J. at the Boutwell Auditorium in Birmingham. The “Home Going and Celebration of Life for Emantic E.J. Bradford Jr.” took place the same date Rosa Parks defied segregated seating laws on Montgomery buses in 1955, sparking the modern civil rights movement and struggle for justice and equality in Alabama. Rev. Jackson tied E.J.’s death to civil rights history, current justice movements and other Blacks killed in encounters with police. “In the images of those battles and the shedding of blood, E.J. Bradford joins those ranks,” Rev. Jackson said. He also echoed the demand that police video footage be released and called for a transparent process. Mr. Bradford Sr., who is fighting cancer, described his son as a man-child maturing into his own as E.J. began caring for his father after the cancer diagnosis. April Pipkins holds with her son, Emantic “EJ” Bradford Jr. 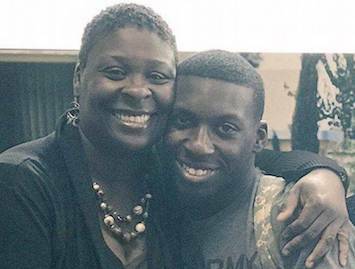 In an emotional moment surrounded by another son and E.J.’s mother, April Pipkins, Mr. Bradford hailed his son as his hero and expressed the pain of the family’s loss. With community backing, the family has called for answers from the city and Hoover police. The hashtag “Say No Mo’ Release the Video!” has been part of the clarion call to protest publically and mobilize since police killed E.J. E.J. was shot to death by Hoover City, Ala., police responding to gunfire at the Riverchase Galleria Mall. Cops initially accused Mr. Bradford of being the shooter which they later recanted. Since the police killing activists and community leaders have called on Mayor Frank Brocato and Police Chief Nick Derzis to step down. The city is deeply-rooted in a racist past and was established from White flight out of nearby Birmingham during the 1960s. It has a mostly White population of 85,000 people. Activists are also calling on an economic boycott of Hoover that enjoys a hefty tax benefit from Black Birmingham residents who shop in the suburb, said Tremon Muhammad, the Birmingham representative of the Nation of Islam. The killing ignited an undercurrent of tension, he said. “Nothing has happened overtly before this. It’s always been brewing … this has been boiling under for a while,” Mr. Muhammad said of Hoover race relations. Attorney Crump told The Final Call, eyewitnesses said police shot E.J. while he was trying to save other people in a chaotic scene. “Witnesses say he was helping people get away and that he wasn’t doing anything but trying to get away when the police within milliseconds shot him in the head, without any verbal commands,” said Attorney Crump. The civil rights lawyer said the whole incident lasted 15 to 20 seconds at the most, and the cop decided in seconds to shoot without any warning. Mr. Crump said nothing else needs to be said until police video footage is released. “If the video shows that the police used unnecessary excessive force, then the family will absolutely pursue their legal remedies to make sure the officer’s held accountable as a civil matter,” Mr. Crump said. He added the family will demand the district attorney hold the officer accountable for whatever crimes occur on the video. A joint statement of the city of Hoover and police department said, “body camera video and other available video has been turned over to the Alabama Law Enforcement Agency (ALEA) State Bureau of Investigation (SBI) which investigates officer involved shootings. Release of any video will be done as ALEA deems appropriate during the investigation,” the statement added. Once the investigation is complete, the entire file is turned over to the district attorney. The city and law enforcement came under heavy criticism in the immediate aftermath of the shooting. The Hoover police department lauded their officer, who remains unidentified and on administrative duty, as “heroic” for shooting E.J. The police plastered E.J.’s face in the media as the shooter. The victory dance by law enforcement and the “false image” of E.J., before any investigation, offended the Bradford family and seriously compromised community relations with police. Mr. Hilliard pointed out that the Hoover police department made it a point to cover the police officer that did the shooting. The tragedy is galvanizing people to organize for change. Mr. Hilliard said the Justice League has a three-phase strategy of “protest, policy and polls” to effect change. “Protest is where we are right now, and this is just bringing awareness to the situation … where we are making people feel uncomfortable, specifically the Hoover Police Department,” Mr. Hilliard explained. The Justice League is leading civil disobedience, like blocking major intersections and demonstrating in front of the mayor’s home. The group will pursue legislative changes to affect the treatment of Blacks by law enforcement. In a statement, Hoover police also retracted their story that E.J. was “brandishing” a gun, which community leaders argue was a mischaracterization that falsely implied E.J. was violently waving a gun, justifying why police shot him. The firearm raises questions because Alabama is an open carry state and E.J. was a licensed firearm owner. E.J.’s killing comes as American mass shootings have risen triple digits for 2018, and a national gun debate rages. A report from the Small Arms Survey said there are one billion firearms circulating worldwide and over 600 million possessed by civilians. The survey reveals that Americans own 393 million weapons—that’s 46 percent of all civilian weapons, or 130 firearms for every 100 people. But with debate raging about second amendment rights, gun advocates and critics say the issue highlights another double standard along racial lines. Whether it’s E.J. 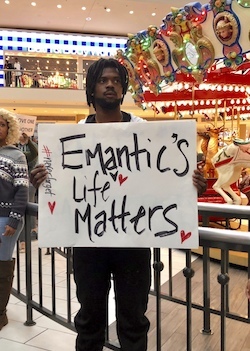 or Jemel Roberson, a 26-year-old Robbins, Ill., security guard killed while doing his job, or Philando Castro killed by police during a Minnesota traffic stop—the common denominator is Black men were perceived as bad guys. Many Black cops try to prove they are part of the police culture, but in numerous incidents, Black officers were injured and killed by White colleagues racially profiling them, he said. In response to the failure to address racial bias in law enforcement and the unjust shootings of Black men, 100 Blacks in Law Enforcement professionals are advocating Black officers off duty and on duty in plain clothes and civilians who legally carry, think twice before drawing their weapons in public incidents. “When you have these incidents … keep your gun in your holster unless you are personally threatened or your family,” advised Mr. Jones. E.J. was making moves, his father told The Final Call. The Monday before the Thanksgiving shooting Mr. Bradford, Sr. helped E.J. get a car to help him get to work and facilitate his daily visits with his father. “I knew my baby done grew up and I was proud of my boy,” he said.